This article was posted on 22nd November 2018. Perhaps you're searching for the perfect Louis-style French bed; a romantic Rococo boudoir; a regal Renaissance bedroom or an elegant Neoclassical-inspired suite. You may dream of a perfectly luxurious combination of them all, or you may not have a clue as to which of these classic styles entail swirls, gilt detailing or columns, but just know your bedroom would be complete with a beautiful French antique style bed. 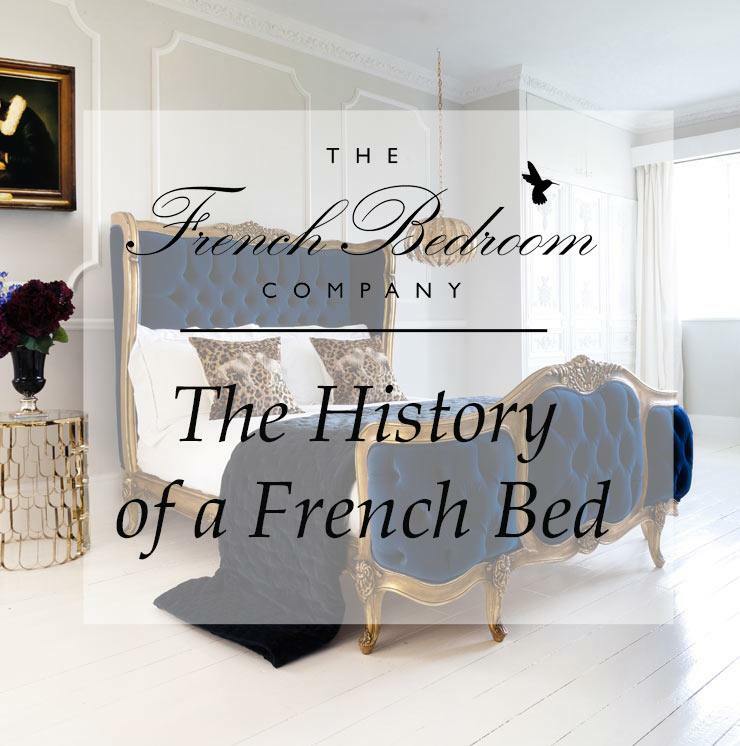 As French bedroom connoisseurs, we believe to fully understand why an item is as perennial and consistently desirable as a French bed, we need to look at its history – and boy, there's a whole lotta history! We warn you though - like with most things you already love – the more you know, the deeper you might fall. From the 16th century, renaissance reigned supreme. Ornate carvings of mythical creatures and floral motifs adorned the carefully crafted furniture. While much of the beautiful French style furniture we see today has very few of the characteristics from the Renaissance period – defined by architectural shapes and dark wooden pieces – this style-revolution is often viewed as a bridge between the middle-ages and the modern pre-industrial era, bringing with it our first sense of interior style and thoughtful design. As France became wealthier under the House of Bourbon's sovereignty (all the Louis! ), a desire for the finer things in life became apparent. Elegance and luxury were the order of the day, with the Palace of Versailles being commissioned during this time. An iconic example of opulence and extravagance, the Palace harked the arrival of Baroque style – large curves, grand pillars and intricate shapes. Initially using 'exotic' woods such as ebony and mahogany for the elaborate pieces of heirloom furniture, then turning to gold gilt and marble to create the ultimate in luxury home decoration. Classic Baroque furniture was characterised by a heavy use of gold leaf set against dark backgrounds and serious themes. Baroque style was a perfect reflection of life in France at this time, a sombre catholic country run by an authoritarian monarchy - dark, rich and mystical. In the 18th century, the French took interior design to a peak of extravagance with Rococo. The decorative response to Baroque, Rococo furniture uses lighter woods and pastel tones. Quite often the prettier, more feminine elements we imagine when dreaming of our beautiful French bedroom. While, the luxury French bedroom furniture we see today highlights the dreamlike, pretty and romantic qualities of the Rococo period, some dubbed this time (and style) as pompous, indulgent and pretentious, leading to the French Revolution in 1789. And so was born Neoclassicism, the antithesis to the extravagance of the Renaissance, Baroque and Rococo styles before it. As France got pretty fed-up with all its Louis and aristocrats, it looked back to eras of (perceived) calm: the Greek and Roman civilisations. France craved serene, logical perfection after the hedonistic luxury of bygone years and the chaos of revolution. The idea of neoclassicism was to capture the spirit of classical civilisations, noted for their strength, wisdom, respect for citizens' rights and patriotism. Neoclassic style embraced the bold, straight lines of the movement as pure, geometric shape and form replaced the more serpentine curves of the Rococo period. It's thanks to all these iconic, style periods that French furniture will remain elegantly timeless for generations to come. A subtle and stylish amalgam of historical eras and antique furniture, the intricate hard-carvings, luxurious silks and velvets and, feminine lines will ensure a French bed is always in vogue. If you're dreaming of a beautiful French bed, but would like some help in choosing your style, contact our in-house stylists for advice on what might work best for your home.